Anyways, after getting dried off from the rain storm, I got to meet with my voice coach who will be prepping my various character voices to a professional level and then finally create the demo. My coach was a great guy, we got into talking about the business behind voice acting and with my knowledge of that and business thanks to the anime figures...it was an easy conversation. My coach's name is Jay Snyder and prior to coming to my evaluation, I didn't bother to look up his prior work...it didn't matter since the goal is to learn more about how to make my voice a tool for the business. Though, anime fans will be very pleased to know (if you don't already) his work is well known and like Vic M...he has his own fan club and avid followers. It was great getting back in that sound booth again, definitely lost most of the butterflies I had during the Bang! Zoom! classes but that self-awareness from the utter silence...still hits me. My greatest challenge to hurtle is that I am not from an acting background. I used to be in select chorus back in school, hell one of my classmates was a semi finalist on American Idol...so voice control and breathing is not an issue...but I never bothered to be in drama classes and what not so I still come off as a bit timid in the acting. People who know me personally know that since becoming a business owner back in 2004 with Amway and in 2007 with the figure business...I've come out of my shell, spoke in front of crowds and have no problem ranting on the internet or in person. In my next meeting with Mr. Gre Snyder, I'll have a number of voices prepped to further build the acting and skill-set. One very important thing we spoke about was that voice acting is a skill...trust me, doing the work in the booth is very humbling even to those who "think" they can dub. This is by far NOT my voice demo. 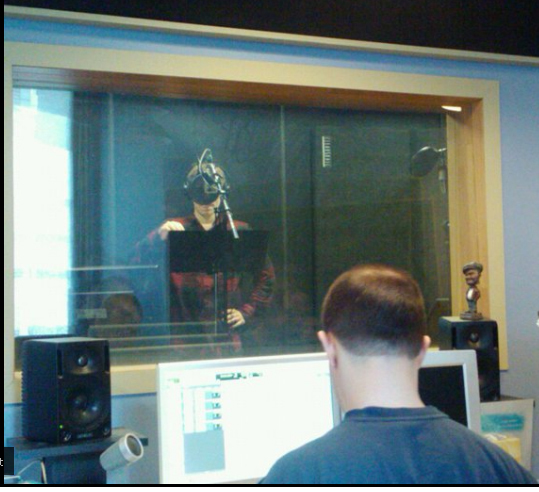 It's nowhere near the final product, it's...but for those curious, that's me, in the voice acting booth. More when I do my next class.